The Workshop of Semi-Precious Stones, aka the Opificio delle Pietre Dure, is one of the hidden gems of Florence museums. The Opificio is a small-scale specialized museum which focuses on the Florentine art of creating mosaics with gemstones. At the museum you can see magnificent pieces created from the 1500's onwards, all made out of semi-precious stones. Let me describe the kind of work you can see at the Opificio delle Pietre Dure. The artist had a model (usually a painting) that they reproduced using stones instead of paint for colors. Let's say the model is a nature scene. Little bits of green colored stone material are cut to create the leaves, carvings of light blue minerals are used for the sky, and so on. Then, it's all put together to form a luminous smooth single sheet of stone depicting the same image as the original painted model. You get a 'painting' made out of semi-precious mosaic pieces. Marble, granite, jade, rose quartz, amethyst, mother-of-pearl and hundreds of other materials from all over the world are used to produce the gorgeous pieces on display. The size of the Workshop of Semi-Precious Stones makes it extremely doable in about an hour and a half, although you could certainly stay longer. Most of the exhibit pieces are on the large ground floor where you can see mosaic pictures, cabinet panels, table tops and other pieces of mosaic art. The top floor shows a huge selection of different colored stones, artisan workbenches, carving tables and the utensils and equipment needed to cut and polish the stone. There are glass display cases which have drawers you can open to see blueprints and projects (you might not see these drawers if you don't know about them since they're underneath the display cases). You will see that Florentine mosaics are unique in that the spaces between each in-laid piece are completely invisible, with each tile blending in perfectly with its neighbor. The museum shows lots of pictures made with these in-laid stone mosaics. Most pictures depict nature scenes but some are dedicated to day-to-day living such as families outings, game playing, or just lounging around. At the Workshop of Semi-Precious Stones you can also see how these colorful stones were used for other items like furniture panels to line the sides or front of cabinets, or to cover the walls of churches or other buildings, for book coverings, picture frames, vases, jewelry boxes and more, all made with semi-precious gems. a dining room table with legs made of engraved wood and the table top a stone mosaic depicting a floral garland and musical instruments all with a red marble background (below). 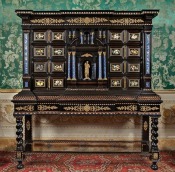 The workmanship is impeccable and the finished product is stunning. Right above this piece the original painted model is on display too so you can see and compare what the original idea was and how it actually came out. I really recommend the Opificio delle Pietre Dure if this type of Florentine art sounds like something you would appreciate. Firstly, the Workshop gives you a chance to see an art which is truly unique to Florence. Originally the Opificio was was established in the 16th century by Ferdinando de Medici in order to have a chapel decorated with Florentine mosaics built for his ancestors. Note: the splendor of the completed mosaic chapel can be seen in the San Lorenzo church, the 'Prince's Chapel'. Secondly, the museum is not widely known or visited so you can enjoy seeing the exhibit without worrying about crowds. Also, it's just the right size: big enough to get a good idea of the craft of Florentine stone mosaics but not so big that you feel overwhelmed and unable to take in all that is on offer. The Workshop of Semi-Precious Stones also handles the language issue in a unique and handy way. Each section has large-size index cards available in German, French, English and Spanish. You take the card for your language and use it to read about each item on display in that particular area. When you're done you just put it back. This low-tech system works very well. Note: at this writing there is no official museum site in English. 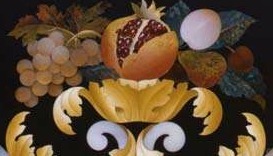 The 'Opificio delle Pietre Dure' site is mostly dedicated to the part of this institution which deals in art restoration. A small section is dedicated to the museum, and is written in Italian.